February is Heart Health Month and we are gearing up for a great Annual Meeting and Hill Day in Nashville, Tennessee, February 26th and 27th. The full details for these two meetings will be found below. We look forward to everyone being together for some wonderful sessions and topics. I hope you plan to attend and bring a colleague with you! Congratulations to all of Tennessee's award winners, both at the district level and the TAND level. We are very proud of the amazing men and women we have in our state representing our profession. Keep up the great work. This month, the Academy of Nutrition and Dietetics is having their election. This is an opportunity for YOU to have a voice in our Leadership. Please take the time to vote, as many of the initiatives that take place at the Academy level affect what we are doing at the state and district levels also. I look forward to seeing many of you later this month! 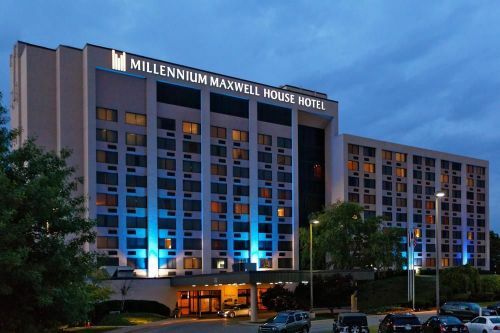 The 2019 TAND Annual Meeting will be held February 26th, 2019 at Millennium Maxwell House Hotel in Nashville, TN. The Hill Day, Feb 27th, agenda is out. Your district's Public Policy Coordinator will be scheduling those in your district to prevent multiple groups from visiting offices with the same message. They will also have information on parking and form to submit to Angie Wallick to record the visit. Brian Carroll is getting a group together to go to the Predators hockey game at 7:00 on February 25th, the night before the Annual Meeting. He needs your name and a firm commitment by today, Friday, February 1st, so that he can try to seat everyone together as tickets in groups of 5+ are already scarce. Please email him at bcarro18@utm.edu if you would like more information or are interested in going by 2/01! Not interested in hockey? Don't miss your chance to network with fellow #TNRDs before the 2019 Annual Meeting at one of these SIX delicious opportunities. #TNRDs will be meeting up to eat at some of Nashville's most popular restaurants. Menus and pricing can be found on each restaurants' website. Vote today for the Academy leadership! Biographical information for the 2019 candidates on the national ballot is available on the election website. Help shape the future of the Academy by exercising your member privilege to vote. When you cast your ballot you will receive a coupon good for $5.00 off your next purchase from the eatrightSTORE! TAND is committed to increasing the number of dietitians with specialty practice certifications in our state. To encourage this goal, TAND is now accepting applications for scholarships (up to $1000) for any CDR approved specialty certifications. Monies awarded can by used for study materials, review course, exam fees, and travel associated with the certification program. Scholarship recipients are required to have successfully passed the specialty certification exam by May 1, 2019. Applications are due by this date, and scholarship recipients will be notified by June 1, 2019. Eligibility criteria and applications are available on the TAND website. For questions, contact Ginger Carney (ginger.carney@stjude.org). 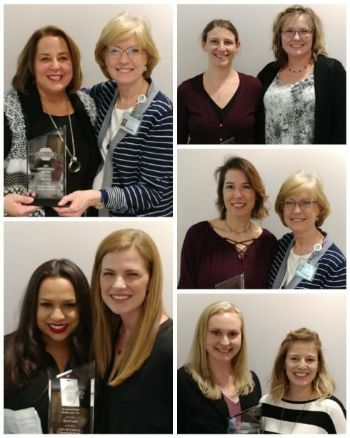 On Thursday January 10, 2019 KAND recognized their award recipients at an afternoon reception at East Tennessee Children’s Hospital. The event began with an interesting and entertaining presentation by Virginia Turner on Dietetics the Past 35 years. Pictured top left in the collage is Kathy Irwin, KAND President-elect. 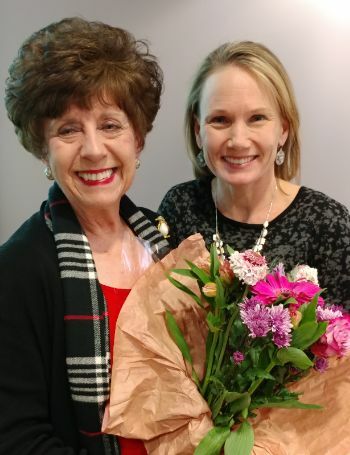 She received the Outstanding Dietitian of the Year award from Janet Buck, Past-president. Kathy is the Clinical Nutrition Manager at Oak Ridge Methodist Medical Center. Clockwise is Courtney Wright, a graduate student and dietetic intern at UT who received the Outstanding Student of the Year award from her major professor, Dr. Katie Kavanagh. Peggy Pratt was awarded the Outstanding Dietetic Educator award from Janet Buck. Peggy is adjunct faculty at UT, teaching a foodservice management course to undergraduate students, and she has a private practice counseling clients with eating disorders. Autumn Kelly is the Clinical Nutrition Manager at Fort Sanders Regional Medical Center. She received the Emerging Dietetic Leader Award from Kristen Clay, KAND Awards Chairperson. Shanthi Appelo received the Recognized Young Outstanding Dietitian of the Year award from colleague Megan Rogers. Both work at the Knox County Health Department (KCHD). Congratulations to all the outstanding award winners! The IRIS award was presented to Katharine Killen (left in photo). Katharine is the Community Relations Director for the KCHD. She created a year-long award-winning campaign fighting health misinformation on the internet; nutrition (including the role of RDNs) was a key focus. 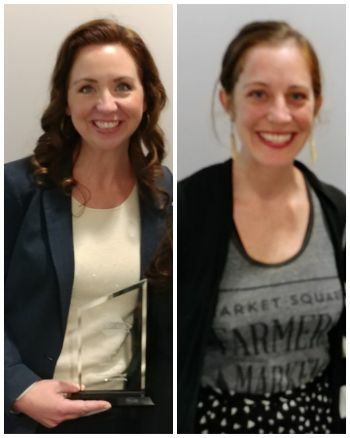 The Community Partner award went to Nourish Knoxville, a nonprofit organization whose mission is to cultivate healthy communities by supporting relationships between local farmers, producers and the public. Accepting the award was Ellie Moore, Markets Manager. KAND recognized retiring member Kitty Coffey for her 52 years of service to the profession. Dr. Coffey has been the department head at Carson Newman University in Jefferson City. She has been a strong and positive mentor to many students over the years. Lori Stowell, a past student, provided a lovely tribute to Kitty’s many accomplishments including receiving a Medallion Award from the Academy. Kitty, thank you for your many years of outstanding service! All abstracts should be submitted via email to KAREN.SMITH@STJUDE.ORG. Submission must be received no later than FRIDAY, FEBRUARY 8, 2019. Please follow the attached guidelines for Abstract Submission. Academy's Tweet of the Week! Check out the Academy's "Tweet" of the week. Way to go TAND!